Bio S&T is co-founded by UBM Sinoexpo and Bosnan Consulting, and has deep collaboration with global biotech professional organizations, biopharmaceutical industry and seasoned financial investors interested in biotechnology. It serves as a new platform for the introduction & exchanges of new development in biopharmaceutical science and technologies. 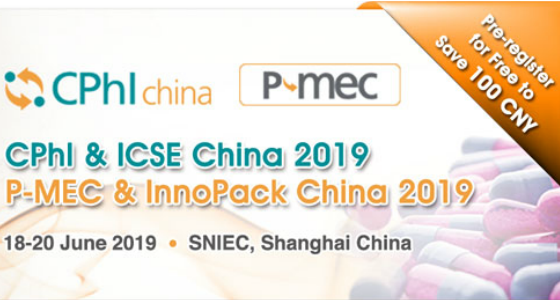 Bio S&T will be held concurrently with CPhI China 2019 at SNIEC on June 18-20 2019. It aims at providing a platform for the booming biopharma industry to showcase itself and obtain latest information. It takes the form of combining exhibition and conferences to link individuals and enterprises and to facilitate the communications among experts and regular members of the biotech industry. The goal is to advance China’s biopharma industry in line with the global market. CPhI China is the leading trade & networking gala of global pharmaceutical industry. Since its introduction into China in year 2001 collaboratively by UBMEMEA, CCCMHPIE and UBM Sinoexpo, CPhI China has been deeply rooted in the API industrial sectors while expanding to cover the entire upstream and downstream chain (for example, lab equipment, pharmamachinery and packaging). CPhI China 2019 is expected to attract over 70,000 visitors and 3,200 exhibitors from more than 120 countries in an exhibition space of 200,000 square meters. Standing on such a big platform, Bio S&T with further strengthen and promote the large molecules drug industries and boost the further development of biopharmaceutical industries of China and the world. Bio S&T will track the latest trends in biotech industry and select the most important topics to be part of a three-day high-quality conference during CPhI China 2019. At the same time, individual biotech companies related to the above topics will showcase their technologies and product development. Three topics will be presented as part of 2019 Bio S&T which are key and interlinked areas in the current biotech industry. Such unique exhibition arrangement will enable broad and unrestricted interactions among the participants and to achieve the ultimate objective of greatly accelerating China’s biopharmaceutical industry. As the greatest bio pharmaceutical invention, therapeutic mAbs has been widely used in clinical medicine practices for decades, and in recent years has played significant roles in tumor treatments which further promoted the development of this field. Bio S&T 2019 will highlight the world’s latest technical updates of the industry with leading players sharing their past experience and future plans. Moreover, start up and newly transformed enterprises in monoclonal antibody fields will also showcase their progress and post upcoming demands in production and financing. As a key bottleneck in the R&D of bio pharma products, Biologicals GMP manufacturing involves complicated procedures, high demand of quality control and large investments. In recent years, the big molecule biologicals GMP manufacturing in China has been rapidly expanding in individual scale and overall capacity, yet it is also faced with challenges in technical depth, quality control and sustainable development. Bio S$T will provide ample opportunities for showcasing and communication, to introduce internationally cutting-edge technologies and equipment and share experience of successful players and competences of new comers, thus to foster the development of the bio pharma industry. Capitals dominate the development of bio pharma industry. The mass inflow of investments in the recent years has boosted China’s biotechnology industry in the short run. However, the companies and products are greatly over-valued, which makes it hard to find technical products with good investment potential and true innovative value. Bio S&T 2019 will provide a platform for face to face communications between investors and pioneering bio companies, to acquire deep insight in industrial development and locate ideal investment opportunities. Xueping Wang, GM of Shanghai R&D, Jiangxi Jemincare Group Co., Ltd.
Weichang Zhou, Chief Technology Officer, WuXi Biologics Co,. Ltd.
Steven Lee, Founder / CEO, BioGENEXUS, LLC. Shun Luo, Chairman, Thousand AKS Biopharmaceuticals Haimeng Co,. Ltd.